Celebrate the announcement of Levitt Shell Sioux Falls with some Sioux Falls trivia! Last week we announced that Sioux Falls, S.D. will become home to a permanent Levitt venue in 2019! In celebration of this exciting news, enjoy these ten fun facts about this booming city in America’s heartland! 1) The cascading falls of the Big Sioux River—the city’s namesake waterfalls—were formed 14,000 years ago, during the last ice age. 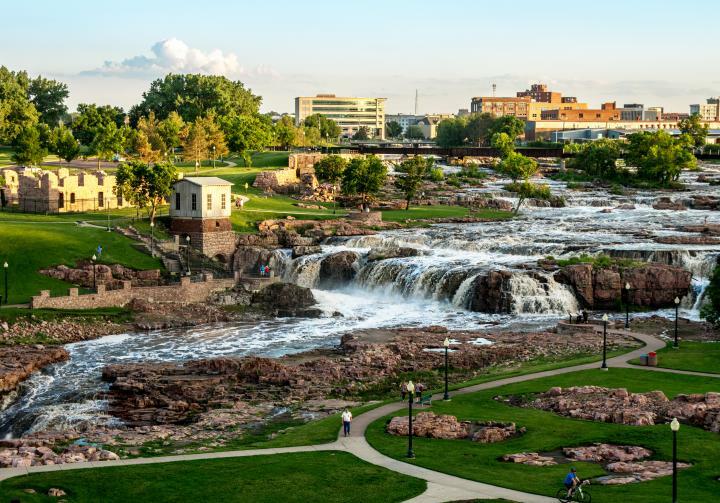 2) Sioux Falls is the largest city in South Dakota. 3) The population of Sioux Falls has grown 22% since 2000. 4) Actress and model January Jones—who you might recognize from her award-winning role as Betty Draper on AMC’s Mad Men—grew up in Sioux Falls, where she spent her early career working as a lifeguard and at a local Dairy Queen. 5) Over 60 languages are spoken in the Sioux Falls School District, with over 140 languages spoken throughout the city—including Croatian, Lakota, Zulu and Scottish Gaelic. 6) The city is home to over 70 parks and greenways, including the 123-acre Falls Park adjacent to downtown (future site of Levitt Shell Sioux Falls). 7) The waterfalls in Falls Park drop an average of 7,400 gallons of water down 100 feet each second. 8) The city’s river and waterfalls cascade over two billion year-old pink quartzite. 9) Sioux Falls boasts a shockingly low unemployment rate of 3.5%. 10) Business is booming—over 90 new businesses have opened in downtown Sioux Falls in recent years. To learn more about Levitt Shell Sioux Falls, be sure to check out their website: www.levitsiouxfalls.org. This entry was posted in Levitt in America and tagged Levitt Shell Sioux Falls on April 29, 2016 by Nicole McGaffey.